Authentic tandoori chicken wings marinated in a sauce and cooked. They are ready to eat after thawing, using a microwave or oven toaster. Product contains 210 g/ package (about 10-16 wings/ bag). Tandoori cooking is native to northwest India, where tandoori chicken is marinated in a spicy yogurt sauce and then baked in a pot. These chicken wings were not fried. They were marinated in yogurt sauce and spices and then the tandoori chicken wings were baked. 16 kinds of spices were used, including curry powder spices. Curry powder was mixed with yogurt and ketchup, to finish off the sauce with a mild taste. The chicken wings are easy to eat, as they are divided into two parts along the bone. 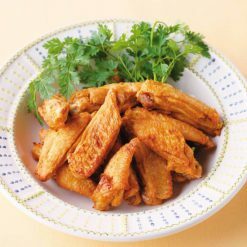 When using a microwave, lay the chicken wings side-by-side on a plate, after removing the frozen pieces from the bag. Please follow the microwave heating instructions and heat for the amount of time as follows:In a 500 W microwave: 2 pieces for 1 minute and 30 seconds; 1/2 bag for 3 minute or 1 bag for 4 minutes and 30 seconds.When using a toaster oven lay the chicken wings side by side on a piece of aluminum foil, after removing the frozen pieces from the bag. Please wait for about 7 minutes (at 900W) to heat.When using an oven, arrange the frozen chicken pieces and heat for about 10 minutes in a preheated oven at 200 ℃.The cooking times listed are approximate. Please be sure to make adjustments to the instructions, based on your appliance model, the size of the container, etc. Please be careful not to burn yourself because the heating process will make the product very hot. 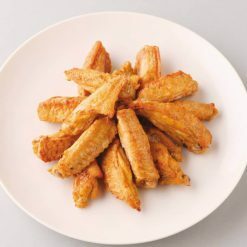 This product contains chicken wings (from Brazil), yogurt, whey protein concentrate, sugar, ketchup, salt, spices (turmeric, coriander, cumin, methi, black pepper, red pepper, cinnamon, mustard, ginger, fennel, nutmeg, celery, cardamom, including Laurel, allspice, clove), dried egg white, yeast extract, vegetable oil (sesame oil, soybean oil), garlic, ginger, pepper dye, wheat (some of the raw materials). This product is not suitable for anyone with allergies to egg, milk, wheat, soy, chicken or sesame.